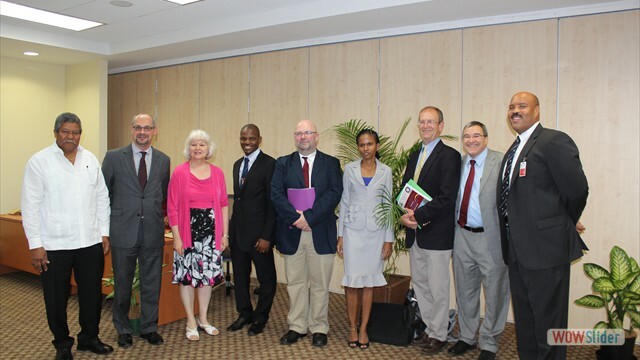 The Caribbean Branch of the US Cochrane Centre (CBUSCC) was launched in June 2013. The development of CBUSCC is a natural extension to the work of the US Cochrane Centre (USCC). Since its inception in 2002, The United States Cochrane Centre (USCC) has furthered the goals of the Cochrane Collaboration by making widely available systematic reviews of evidence on the effects of healthcare. The Caribbean which is comprised mainly of Small Island Developing States (SIDS) has a strong background in health research which is led by the regional universities. Over the past two years the University of the West Indies through partnership with the Cochrane Collaboration, has facilitated the training of a cadre of researchers in knowledge synthesis and knowledge translation methodologies. From this partnership the idea to create a Cochrane Centre Branch arose as a way of maximizing the interaction between the countries of the region, and allowing a more intense level of Cochrane dissemination. Identifying and providing a forum for the region’s resources in systematic review. Providing regional training and support for English speaking review authors and other contributors to the Cochrane Collaboration. Promoting the use of Cochrane Reviews throughout the region. Providing access to the Cochrane Library, especially access to health research conducted within the region. Identifying additional sources of funding for regional Cochrane activities. Establishing key alliances with existing regional organizations. Disseminating information about the Cochrane Collaboration throughout the region.